You are currently browsing the tag archive for the ‘Chinese Antique’ tag. Below is a pot I picked up from Mr. Tanaka at Aichi-en in Nagoya. 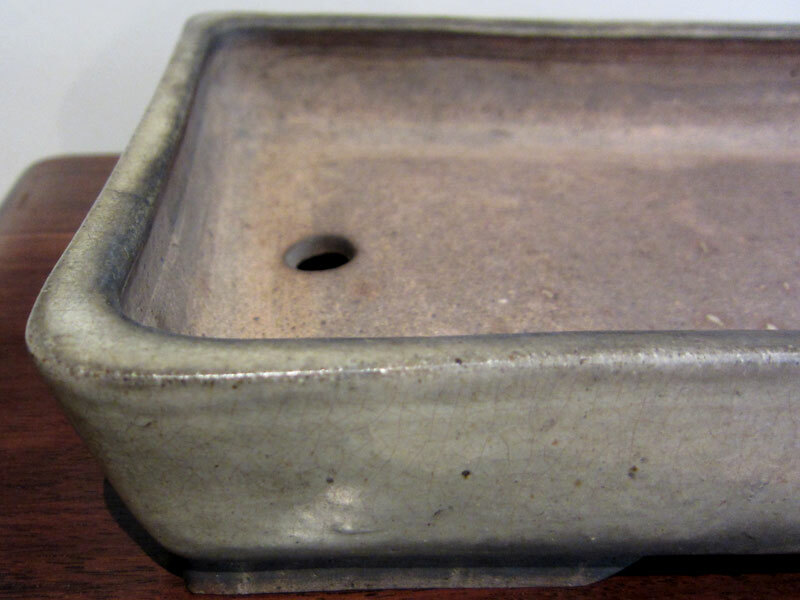 It is an antique pot and I think it is from the Nakawatari or middle crossing period. I am by no means an expert on antique chinese pots (this is my first) but from what I have been explained Chinese antique pots are roughly divided into 3 categories. Huruwatari, Shinwatari, and Nakawatari. These correspond to periods of wars between Japan and China during which time many pots and other goods made their way to Japan. Ever since seeing the antique Chinese and Japanese bonsai pots in the Kokufu exhibition catalogues I had wanted to own one. 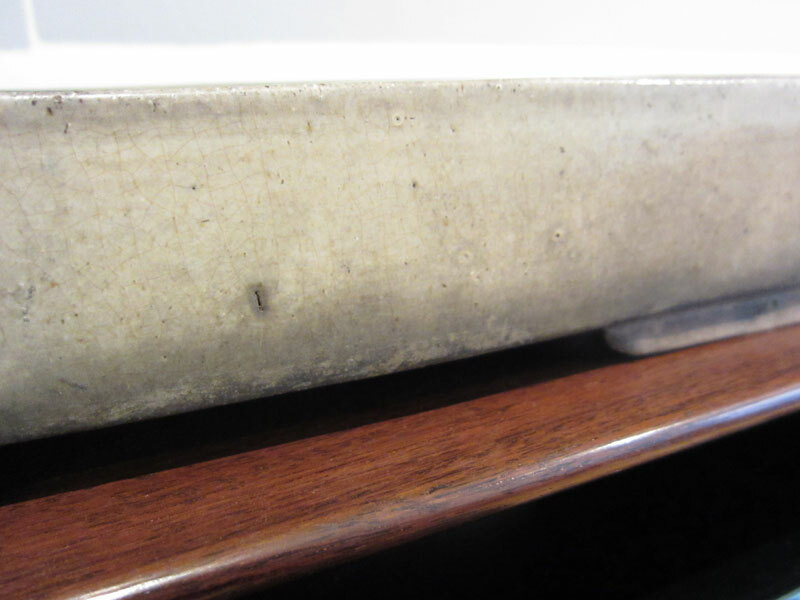 I was especially drawn to the white or cream containers that have become in some cases almost black from the layer upon layer of patina that builds up on them. You can see the imperfect warped edges. When I was pot shopping this last trip I had a rough list of pots that I was interested in buying. I had also made a deal with myself that I would buy usable sizes instead of falling in love with pots that would only ever be mantle piece ornaments like some of my previous purchases. While visiting Aichi-en, Peter Tea and I searched the nursery for a pot that might fit my needs. We came up empty-handed after a 30 minute search. Peter then asked Mr. Tanaka if there was anything that might suit and he headed out to the piles of pots we had just searched only to return a minute later with the perfect pot in his hand. A detail fo the glaze, patina and surface inperfections. The pot I ended up buying was a good size for the bonsai I like to grow. I guess it would fit trees in the Chuhin range. Also being of this grey/ white colour I think it will go well with a range of different deciduous species. The pot itself is full of imperfections and it is a little wonky. If you look along any one side you will notice that they are slightly off square and or bowed. I really like this. In most of the high-end Japanese pots the geometries are perfect so it is nice to own a pot that has some rustic character to it. I am very happy to own this pot and I hope to give it some use in the near future. If anyone knows more than my basic understanding of Chinese antique pots or would like to make any corrections to my description please post in the comments. I am interested in learning more about these pots and the times that they came from so please comment if you know any more.